Located directly south of Amsterdam’s renowned city centre is De Pijp, one of the most sought after neighbourhoods in town. What was originally built in the 19th century to house the working-class population spilling over from the Jordaan, has blossomed into one of the most vibrant areas in Amsterdam. How it became known as ‘De Pijp’ is something of a mystery. Some say it’s due to the district’s long, narrow streets that run like pipes in a building, while others claim that it was named in honour of a former energy company in the area called ‘Pipe’. Whatever the reason, De Pijp now resides in the hearts of the many students, artists, professionals, families and tourists flocking to this nightlife hub for a borrel (drink) on any given night of the week. De Pijp is the ultimate place where everyone wants to be and be seen. Referred to as the Quartier Latin of Amsterdam, De Pijp is a multicultural melting pot offering up a lively mixture of culture, food and sights. Nowhere is this more perfectly represented than on the Albert Cuypstraat, where exotic food and mainstream cuisines are available for the thousands of people passing through. Home to the Heineken Experience (formerly Heineken Brewery) and the famous Albert Cuyp Market, De Pijp has a hip and happening scene with a rich variety of trendy bars, buzzing cafes and restaurants. 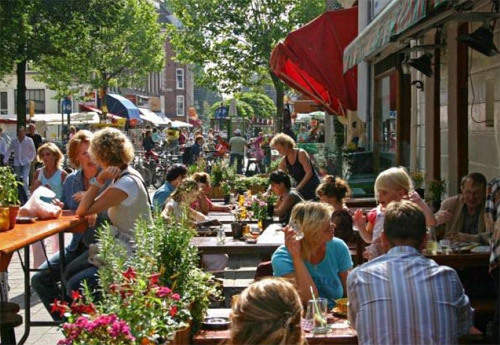 Once you’ve mastered the art of people-watching on one of the many cosy terraces, you can take a walk along Amsterdam’s largest and busiest open air market, the Albert Cuyp Market. Here you can buy and sample many Dutch delicacies like a stroopwafel (a treacle waffle), poffertjes (mini pancakes), haring (pickled herring), or even a bit of good old Dutch cheese. If music is your scene, then De Badcuyp is always open for those in the mood for a bit of live jazz and world music. What better way to finish up a night out than with a spot of dancing? If you feel like hitting the dance floor then head over to Monte Cristo during their dedicated Salsa and Zouk nights (weekends only), down a cocktail (or not) and let your Latin moves flow! Allowing you to dive that little bit deeper into Dutch history and culture is the Heineken Experience, just a short walk from the hustle and bustle of the Albert Cuyp Market. Here you can indulge in guided tours of the historic brewery and look back at fifty years of commercials for what is arguably the Netherlands’ most famous products: Heineken beer. Even if history is not your thing there are games, interactive exhibits and plenty more to see, all washed down by a nice cold beer . Heineken of course! Amsterdam is a beautiful city, come rain or shine, but believe us when we tell you not to venture outdoors without an umbrella or waterproof poncho. You never know when it’s going to pour down with rain, but when the sun shines it truly shines and there’s no better way to soak up the rays than sitting at one of the busy terraces in De Pijp or taking refuge from the bustle at the nearby Sarphatipark. Just a few minutes walk from the Albert Cuyp Market is this well maintained, peaceful park designed in the style of an English garden, perfect for a planned or impromptu picnic in the sun, with or without friends. Take a book, something scrumptious from the Albert Cuyp Market, or just get a ‘broodje’ (sandwich) from one of the Surinam sandwich shops nearby, and find yourself a spot by the pond or fountain. Simple. Relaxing. Fun. On the subject of food and drink, De Pijp is brimming with cafes and restaurants just waiting to quench your thirst or hunger. There’s everything from exotic eateries to traditional fare served up in places like the De Duvel and Restaurant Azmarino. There’s even a little shop/stand called ‘Ijscuypje’ selling ice cream to the masses in the summer, transforming into ‘Stampotje’ during the wintry season where they offer traditional Dutch stampot (mashed potatoes with vegetables and meat) to take away. A little further down the road (opposite the Oranje Church) is Wild Moa Pies for a quick, informal lunch consisting of - you guessed it - pies! Whether you are planning on staying in the area or just passing through, De Pijp is easily accessible by tram, with lines 3, 4, 12, 16, 24, and 25 stopping close by. De Pijp offers many places where you can rest your head at night, from high-range, mid-range to budget accommodation. Amsterdam Stay has a large collection of affordable apartment rentals and unique accommodations in The Pipe area, some beautiful places.